An often-overlooked factor in maintaining your vehicle’s engine and even when purchasing a new or used vehicle, is the timing belt. The rubber-timing belt, sometimes a steel timing chain, is the part of your engine that synchronizes the rotation of your crankshaft and camshafts so that your engine’s valves will open and close properly. Because of the constant strain they’re under, they will also begin to wear out over time, which makes replacing them extremely important. Recognizing the signs that your timing belt is beginning to wear out could mean the different from replacing it in time and suffering extensive damages to your engine. If you begin to notice these or any other signs when turning on or driving your vehicle, be sure to have the issue looked at and repaired immediately. • Plastic in the Oil Pan– This is the most severe symptom that you can be faced with, if you find plastic chunks inside your oil pan then seek a professional mechanic immediately. The plastic chunks are usually from the camshaft gears and when your timing belt is older and stretched or worn out, it can skip timing, which can break off camshaft pieces. When this occurs it can cause the oil pressure in the engine to fall drastically and the change in oil pressure will lead to a complete engine failure, which will then require the motor be rebuilt. • Rattling Noise in the Front of the Engine– If you begin to hear a rattling noise near the front of your engine, this usually means that the timing belt is loose or that the chain may be beginning to come apart. If you hear this rattling, make sure to raise the hood and inspect your engine before continuing to drive the vehicle, if the chain or belt breaks then there are extensive damages that can be caused as a result. • Engine Fails to Turn Over– If your timing belt has already broken, then your engine will be completely unable to turn over or ignite. You may hear the starter engage but it won’t spin over as the timing belt controls the crank and the camshaft. If the issue is being caused because the timing belt is broken then there’s a chance that other engine compartments are damaged. Most of the time, the timing belt breaks while the engine is already running. • Oil Leaking from the Front of the Motor– Oil leaking from the timing belt cover will usually occur in the event of a break or as it wears down. The cover is usually secured by nuts and bolts but over time these can become loose. Oil leaks can also be caused if the gasket between the engine block and the timing cover wears out or is cracked. In the event of any oil leak, checking all of these will help reduce the damages caused. Replacing your timing belt is tricky as often times you don’t know your timing belt is being worn out until it’s already broken and it’s too late. 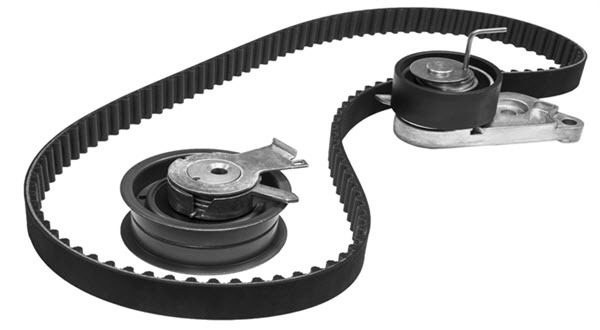 In some vehicles the timing belt is easily accessible and between two people with experience, can be changed at home in an afternoon but if it’s in hard to reach places or you’re uncertain how to access it, taking it to a professional auto mechanic remains the best possible option to prevent further damages. It can be hard to diagnose that a timing belt is nearing it’s breaking point, most times it will simply just suddenly break. To avoid repairing your timing belt and the engine completely, it’s recommended by most auto mechanics to replace your timing belt every 60,000-100,000 miles and you can consult your manual for the manufacturer’s recommendation as well. Some vehicles have steel timing chains as opposed to the traditional timing belt. These look closer to bike chains and because they’re steel, wear down much slower and don’t need to be replaced nearly as often. 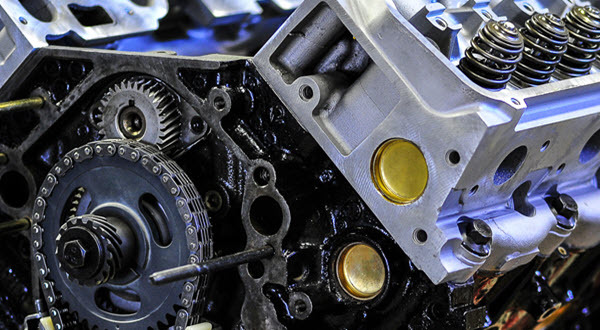 Unfortunately, the only time to know when to change a timing chain is after it’s broken so having your vehicle routinely inspected and the timing chain looked at will keep you up to date with your vehicle’s needs. Replacing your timing belt as preventative maintenance will usually cost you between $500 and $900 which can seem expensive but compared to the $2,000 or more cost of replacing the belt and any broken valves, pistons or the water pump, more and more drivers are choosing to opt for the preventative maintenance. Knowing the mileage on your vehicle along with the age of the timing belt is a great way to stay ahead of any potential damages that can be inflicted in the event of it breaking while driving. Staying aware for any unusual sounds along with these symptoms and any others will also make sure that when the time comes for maintenance on your vehicle, it’s not the entire vehicle you need to replace.